Getting more Troops – Fitness Troopers that is! – As we battle Obesity in Arkansas! Improve the health of all Arkansas communities by increasing physical activity and healthy eating to reduce and prevent obesity. Increase the percentage of Arkansans of all ages who have access to healthy and affordable food and who engage in regular physical activity. It is great to see states join the battle and promote proper health, fitness and nutrition like the – Big Push – Across America’ does. 7 AM – I wanted to say a BIG THANK YOU! To Ernie Paulson the Sports Broadcaster for KARK Channel 4 Little Rock. You were a great supporter for the BIG PUSH and hope to see you next year when we travel through all 50 states on our Fitness 4 All 50 State Tour “organization’s mission is to serve as a catalyst to inspire, motivate and empower our nation’s youth, parent’s teachers and the American people through educational presentations given to between 3,000 to 4,000 schools in all 50 states to help them learn why making healthier lifestyle choices by helping each student develop a vision for their personal fitness activities and sports, making good daily nutritional choices and build internal motivation of those ideas. So they are motivated from within to seek out healthier choices on a daily basis. Our last interview with Ernie Paulson and the Camerman Charlie a different angle as KARK ch 4 Little Rock has last morning interview. Thanks Ernie & Charlie we great appreciate you! 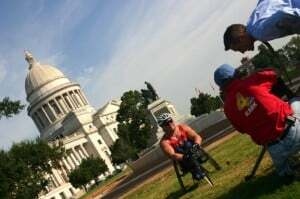 We departed for the State Capitol in Little Rock for a meeting with Ernie Paulson and KARK Channel 4 of Little Rock. Ernie Paulson did a more in-depth interview about the tour and wanted to make a longer piece that would air later in the week. 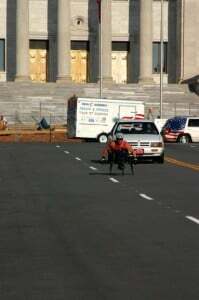 Ernie’s photographer, Charlie, wanted to get various shots of me pushing around the Capitol Building on my way out of town. The entire interview and shoot took approximately 2 hours. 10:15 AM – We departed Little Rock on Highway 5 for Benton, AR. It was 12 miles to Benton. Kevin flys down the road Little Rock to Benton - Perla-Glenrose- AR - Everyone he see's he says; "Let's get Fit!" At Benton, we stopped for a quick interview with the local paper and met with city and community leaders. Pushing it to the Limits with a message of Fitness for all! 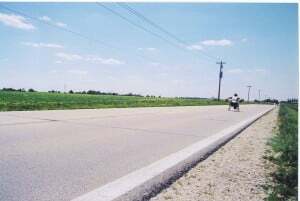 After our stop in Benton, I had to push on the side of Interstate 30 for 9 miles to Highway 67. From the junction of Highway 67 to 229 I resumed pushing. There was a pretty good shoulder to ride on, but there were a lot of steep hills. I pushed for 14 miles into Glen Rose. From Glen Rose it was 4 miles Perla, AR. In Perla I took a break and a drink of the half water / half Gatorade mixture the dietician for extreme endurance athletes gave me to repellence my electrolytes during my 5 minute break and then pushed 5 more miles into Malvern, AR. 5 PM – We loaded up from pushing and drove to our hotel to rest for the evening. We checked into the hotel and unloaded the trailer. Dora and Andy went to the grocery store to stock up on healthy foods. We ate dinner and got ready for the next day. 11:30 PM – As normal we downloaded our pictures we had taken for the day edited them put captions under them. Wrote our blog and uploaded everything to our website after we had finished everything we went to bed. Tomorrow will be another long day and we have miles to go! 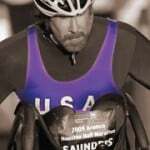 Miles to push many Revolutions on my wheel carrying a message of Fitness 4 All on our BIG PUSH we will have presentations to give, media interviews of all kinds to do. So we need our rest as it takes me longer to get to bed and get up because of my paralysis being paralyzed completely from the chest down. It’s NOT EASY but you so me something worth doing that ever is…making a difference is tough and so is changing people’s and our nation’s youth, parents, teachers and the American people’s mind about making healthier choices for eating right making better healthy choices for what they eat on a regular basis and finding the time or making the time to get involved in fitness activities or sports and go for it from 30 minutes to an hour – Break a Sweat! Be sure to check with you before you start a new exercise program – we need to find a way to help people get a check up like we used to when I played football before we started practice, it shouldn’t be that hard! Well, you all have good nights sleep and we’ll see you tomorrow because; There’s Always a Way to reach your goals and Live Your Dreams when you Never Give Up!